Box Text: Given in recognition of your partnership with PlayStation Consumer Services. We are proud to work with the best people and companies in the world. Thank you for your efforts and dedication in making PlayStation the best place to play! 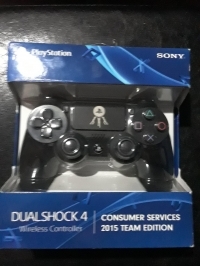 This is a list of VGCollect users who have PlayStation 4 Dualshock 4 Wireless Controller - Consumer Services 2015 Team edition in their Collection. This is a list of VGCollect users who have PlayStation 4 Dualshock 4 Wireless Controller - Consumer Services 2015 Team edition in their Sell List. 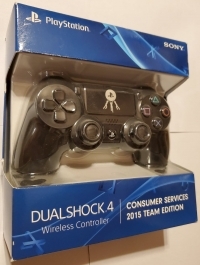 This is a list of VGCollect users who have PlayStation 4 Dualshock 4 Wireless Controller - Consumer Services 2015 Team edition in their Wish List.